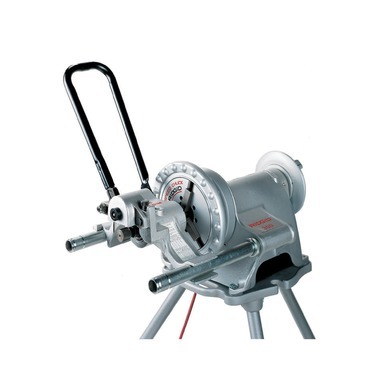 The RIDGID Model 916 Roll Groover is the most durable and efficient lightweight portable unit available. Built with a solid, durable cast-iron housing, it withstands heavy usage, yet is light enough for easy transportation. The 916 features a patented single stroke feed mechanism that allows for accurate operation quickly and effortlessly. Quick and easy mount to RIDGID Nos. 300 Power Drive, 535 or 300 Compact Threading Machines. Lightweight, only 33 lbs., allows for easy transport and storage. Optional Roll Sets for: Copper 2″ – 6″ (Types K, L, M, DWV), 1″ Sch. 10, 40 steel pipe. Optional 1 1/4″ – 1 1/2″ and 2″ – 6″ AWWA Roll Sets.